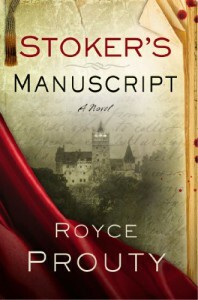 When the original manuscript for Bram Stoker's Dracula comes up for auction, Chicagoan Joseph Barkeley, an authenticator and purveyor of rare books, is hired by a European family to obtain Stoker's Manuscript and personal notes and deliver them to Dracula's Castle in Romania. Barkeley, a Romanian orphan as a child, returns to the land of his Transylvanian ancestors with the manuscript, only to find out that he has been hired by the storied Dracul family. Set in present-day Chicago and Romania, the story weaves true historical events and figures from the 1890s with a fresh, science-based rendering of the vampire mythos. Prouty’s novel is rich in atmosphere, historical detail and offers a new vampire mythology; the author does an excellent job of blurring the lines between fact and fiction. It started really well, all unspoken menace and malevolent portents but I personally struggled with Prouty’s vision of the vampire. After I had come to terms with that I struggled with the romantic aspect (not necessary) and also the religious overtones (too much God).